Three of the world's leading children's education campaigners have written an open letter demanding the release of more than 200 schoolgirls who were kidnapped one year ago next week. Joint Nobel Peace Prize winners Malala Yousafzai and Kailash Satyarthi have joined with United Nations Special Envoy for Global Education Gordon Brown to plead with the international community to keep up the fight to free the girls and to create more safe schools for education free of fear. They want world leaders to invest in strategies and systems to make schools safer in countries where terrorism has escalated. On April 14, 2014, Boko Haram gunmen swarmed the town of Chibok in northeastern Nigeria and abducted more than 200 girls in the dead of night. They have not been seen since. Worldwide outrage followed over the mass abduction and a campaign, Bring Back Our Girls, was launched. But repeated attempts to locate the group have failed. Now, the campaigners want to ramp up efforts to find them and remind the families of the kidnapped girls that the world has not forgotten. Beginning this week, a seven-day remembrance of the girls will include vigils, marches, demonstrations and letter-writing. Schools in Nigeria are being called upon to organise marches under the title Global Schoolgirl March. 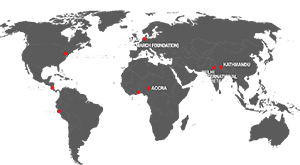 And the Chibok Girls Ambassadors - schoolgirls aged 10 to 18 who have volunteered their time in support - will be joined in campaigning across the globe by A World at School's Global Youth Ambassadors, who will organise vigils in support of the girls in more than 100 countries. The letter, organised by Mr Brown, will be sent to new Nigerian President Muhammada Buhari - who has promised to crack down hard on Boko Haram - and other global leaders. "We wish to reawaken the international community to the plight of more than 200 Nigerian girls kidnapped from their school on April 14 last year and who have been held captive for a year by an organisation whose name means 'western education is a sin.’ The girls have been taken prisoner simply because they wanted to study and to enjoy the benefits of an education. "A year on, the girls' parents wake up every morning not knowing whether their daughters are alive or dead and whether they have been violated, forced into marriage or sold into slavery. We support the week-long remembrance of the girls, starting on April 8, and the call that they be immediately returned to their parents. "We call on all who can do so to join with Nigerian school pupils in the Global School Girl March and to engage in supportive activities working alongside the Chibok Girls Ambassadors and A World at School’s 500 Global Youth Ambassadors in more than 100 countries round the world. "And we call on the international community to give every possible assistance to the new Nigerian President Buhari, whom we welcome to office, to secure the earliest possible release of the girls and to create Safe Schools in Nigeria in which girls will be able to learn in secure surroundings, free of fear." The letter follows a call from Mr Brown last month, when he said at the UN it was time to end the militarisation of classrooms. You can make world leaders hear your voice by signing the #UpForSchool Petition, which demands they keep to their promise of education for all, free from danger and discrimination.